In the bad ol’ pre-Galaxy S days, most cellular phones would keep a log of your texts. The phone kept the texts that you sent or received in sequential order, regardless of who sent or received them. Texts stored sequentially are old-school. Your Galaxy S8 keeps track of the contact with whom you’ve been texting and stores each set of back-and-forth messages as a conversation. 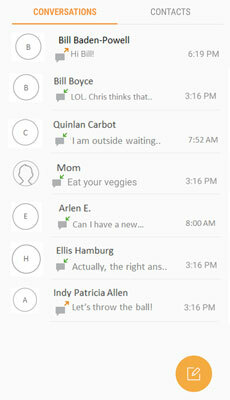 In this figure, you can see that the first page for messaging holds conversations. After you start texting someone, those texts are stored in one conversation. As the figure shows, each text message is presented in sequence, with the author of the text indicated by the direction of the text balloon. Note the Enter message text box at the bottom of the screen. With this convenient feature, you can send whatever you type to the person with whom you’re having a conversation. In the bad old days, it was sometimes hard to keep straight the different texting conversations you were having. When you start a texting conversation with someone else, there is a second conversation. Before too long, you’ll have multiple conversations going on. Don’t worry. They aren’t the kind of conversations you need to keep going constantly. No one thinks twice if you don’t text for a while. The image here shows how the text page can look before too long. 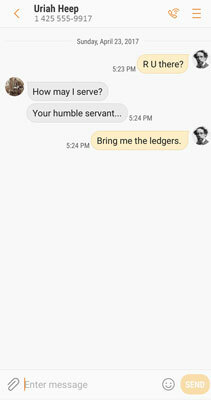 The Text screen showing multiple conversations. It is easy to change the font size of conversations. To make the fonts larger and easier to read, use the stretch motion. Use the pinch motion to make the fonts smaller so that you can see more of the conversation.